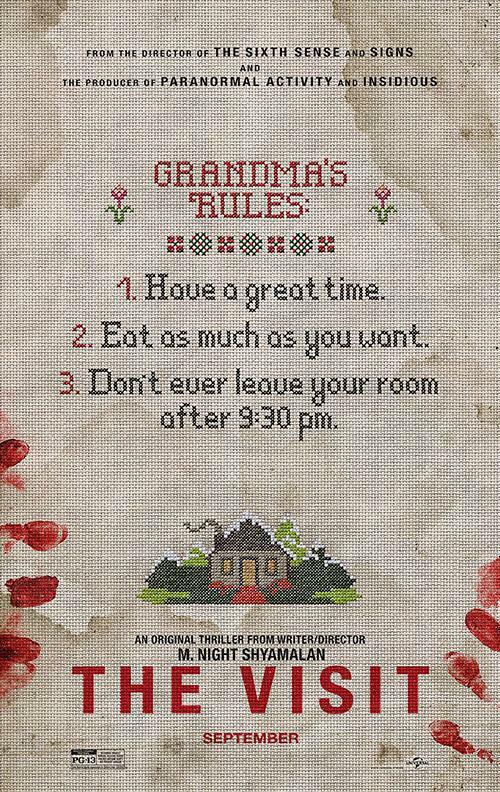 ‘The Visit‘ is the newest film from writer/director/perfectionist M. Night Shyamalan and bows on September 11, 2015. The director has been more involved over-all with Visit since he took the time to edit the film himself thereby retaining total control of the project. In addition to the film, Shyamalan has been closely involved with a new TV show, ‘Wayward Pines‘ and has exec produced three episodes and is directing one. He has also been writing the next project after ‘The Visit‘ called ‘Labor of Love‘ which Bruce Willis is already attached. Back to ‘The Visit‘ though. Single mom of a boy and a girl see nothing harmful with indulging her parents’ wish to have the children come visit them. There are the typical rules a child should expect at grandma and grandpa’s like eating all you want, but grandpa throws in a bedtime of 9:30, which is odd when he follows it up with the advice that they shouldn’t come out of their room after that. The thrill of a good Shyamalan film is there, after watching the trailer, I’m curious what kind of backward twist he’s implemented. Add the director to the producer of ‘Paranormal Activity‘, ‘The Purge‘, ‘Insidious‘ and ‘Sinister‘ and this will be one hell of a pee-your-pants scare for sure. Are you as excited as I am for September?! This entry was posted on Friday, April 24th, 2015 at 4:47 pm	and is filed under Film, News, Television. You can follow any responses to this entry through the RSS 2.0 feed. You can skip to the end and leave a response. Pinging is currently not allowed. « Universal Feature Film Calendar Unveiled At CinemaCon!!! I'm driving down the road with your head stuck in my window. What does it look like I'm doin'?